"Some like tank or waistcoat Merino knits because they fit neatly under a blazer. Others need sleeves and choose from V or crew necks. Whichever your case, a selection of smartly-coloured Merino knitwear is a failsafe investment. They’re temperature-regulating, so you don’t need to wait for a specific season to sport them. Choose your collar and your colours." 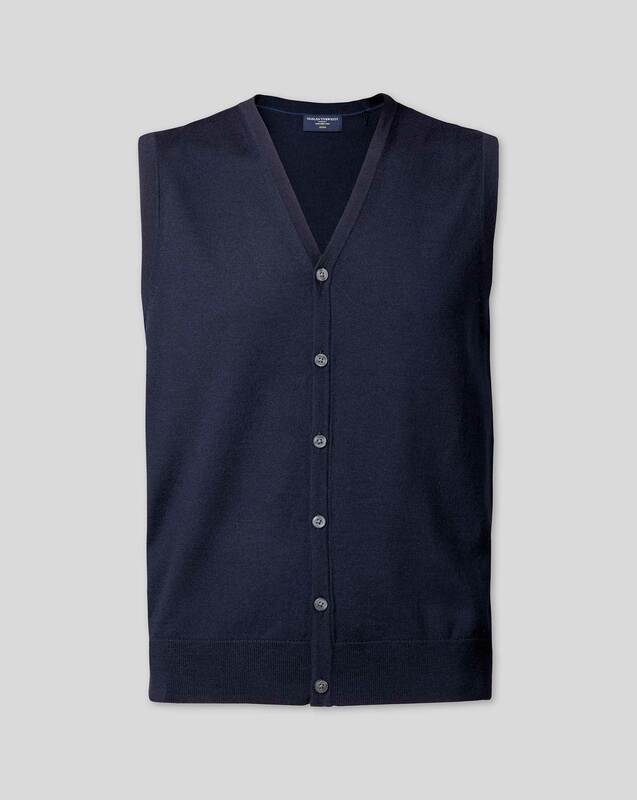 "100% merino wool knitted waistcoat with straight hem and no pockets; ideal for layering." now your website has annoyed me. I have given my frustrated answer. Response from Charles Tyrwhitt: I am sorry that you were not able to take advantage of the multi-buy we have available on our knitwear due to low stock. We do try our best to keep our warehouse full with stock however, it can sometimes be challenging to forecast demand – especially with the sizes and colour combinations. It is always difficult to determine and I am sorry that you have felt frustrated by this. I have made sure your comments have been shared with the relevant department to ensure that we can review stock levels and minimize this occurrence on your next purchase. Fine, soft merino wool waistcoat. Looks smart. Would recommend.